Next week classes run from 9:00am to 1:30pm. After school work time, mandatory for students with any “I”s run from 1:30pm to 3:30pm. We look forward to seeing all families next week, talking about our students’ progress and reflecting on next steps. Zero period algebra continues to meet as usual Monday through Thursday, and office hours are running every day except Wednesday. How do I sign up? Email Natasha Morse at nmorse@davincischools.org by Wednesday, March 2nd AND complete the online waiver: http://lacounty.info-komen.org/site/PageServer?pagename=PSD_2016_TR_volunteer prior to the event. There’s never been a better time to support Da Vinci Schools, and every gift makes a difference. Make an online tax-deductible gift today by clicking on this link: http://www.davincischools.org/makeagift.shtml. Student Led Conferences (SLCs) are next week! Make sure you have signed up online – you can find all the links on the DVC Portal: http://dvcportal.weebly.com/ or below. Class runs from 9:00am to 1:30pm on SLC days. If you have an “I” in any class, you must stay after school from 1:30pm to 3:30pm and work on your missing assignments so that you are passing all of your classes. We will be having two summer school sessions for students to recover course credit. You can sign up during SLC week, but start planning now! In preparation here is the current summer school plan. We may add one or two courses over the next week, so stay tuned. All DVC summer school courses will take place at DVC this year. There’s never been a better time to support Da Vinci Schools! Thanks to a generous matching challenge by Chevron, Belkin, Northrop and Kinecta, every donation and pledge made by March 31 will be DOUBLED, up to $50,000. All pledge payments must be received by June 1, 2016 to be eligible for the match. The Annual Giving Campaign is our top fundraising priority – and the fundraiser we ask EVERY family to support. Gifts to the Annual Giving Campaign make up the difference between what the state provides and what it really costs to deliver an outstanding Da Vinci education. Every gift makes a difference. Make an online tax-deductible gift today by clicking on this link: http://www.davincischools.org/makeagift.shtml. We will be hosting our Spring Dance this March (date coming out this week), and we are looking for a committee of parents to help with decorations, food and supervision. If you are interested, please email Nathan and we will put together a committee meeting, likely next week. We have scheduled three upcoming teaching symposiums for prospective 12th grade teaching candidates and we are looking for parent volunteers to interview teachers these days. There will be two sessions each day, and we would love to have 2 to 4 parents at each session. No experience is needed, we have prepared questions for you to fall back on, but we often find that the interviews become less structured and more like conversations, which is great. If you are interested in either session (or both), please send Nathan an email! 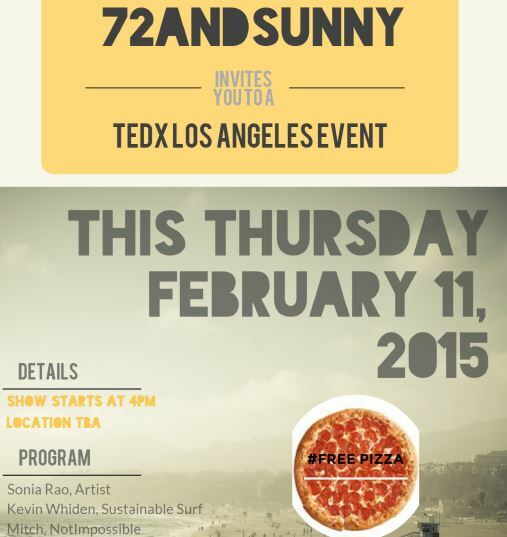 TEDxLA Event Today at 4pm! We hope that everyone had a great time visiting colleges yesterday and came back a bit more inspired to work toward heading to one of the places we visited after your DVC career! And join us in April at 72andSunny! DVC – we’ll see everyone tomorrow for our college field trips! Parents – we encourage you to use this opportunity to talk with your child about their trip before and after to begin (or, even better, continue) the conversation about college and plans after DVC. 11th grade: UCLA, arrive by 7:45am. Students will take the culver city bus #6 from DVC to UCLA (only one bus). We will depart from DVC at 8:00 a.m. and will return by 3:00 p.m.
10th grade: UCI and CSU Fullerton, Arrive by 8:15am. We will be taking 2 school buses. 9th grade: Cal Poly Pomona and Claremont McKenna College, arrive by 8:15am. We will be taking 2 school buses. Want to teach art to elementary students over the summer? Come to Buckner’s room (Design room 206) tomorrow (Wednesday) at 4:15pm, after coming back from the college trip.